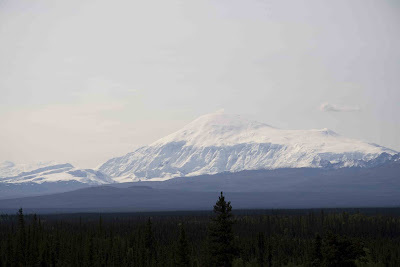 The Life of Brad: Aug 12 Anchorage to Haines - 1225 km day!!! Big riding day! Started in Anchorage around 8:30 am and went all the way to Haines, AK in order to catch the ferry to Juneau the next day. Unfortunately you can only catch the ferry from Whittier (pretty close to Anchorage) to Juneau once a month Aug. 26 and it was full. So I made my way to Haines, which is below the Yukon and began the Inland passage. 1215km. Palmer to Mile 92, was great. Mile 92 was where I had to wait 30 minutes for construction, which made sense as to why there was no traffic coming my way. C=8,R=8,T=1,V=8. Great piece of road with river views and mountain back drops. Mile 92 to Tok not as good. Tonnes of frost heaves, but the views were still fantastic. C=7,R=3,T=2,V=7. Back into Canada for about 5 hours. Thought about staying at Beaver Creek and Haines Jct., but everything was $75 + so I kept on. Poor photo of Entering Canada sign, it was exciting though. Haines Jct. to Haines, Amazing! Stunning views and the road was really good. 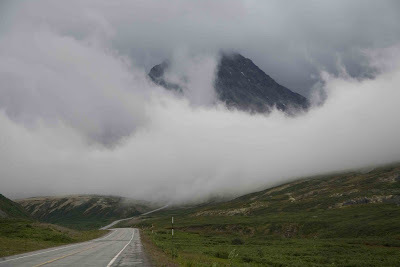 My friend Michel took this road and ferried across to Skagway and back to Whitehorse, which is also an amazing road that I didn't go on this time. One of my favourite photos from the trip. Look at where the road goes! Needless to say I had to ride in a bit of fog thick as pea soup. No shots of Haines as it was raining and quite dark when I got there. Stayed at Beaver Creek cabins and scored a cabin for the price of a dorm bed as the owner had given my bed away. SWEET! Haines looks like a quiet little town to hang in for a day.